Intentional cruelty consists of physical abuse to the animal whereas acts of neglect include denying basic care and necessities. Noticeable wounds, severe matting and manage, signs of starvation like visible bones, and open sores are all obvious signs of an abused animal. Pay attention to animals’ signs of distress. While they are unable to speak, animals can express their anxiety and stress through whining, howling, or barking. If there are consistent audible signals, urgent care is most likely required. While all acts of aggression do not indicate abuse is taking place, behaviors like hiding, cowering, and fear-biting, especially around an owner, could suggest abuse is taking place. Too many animals on one property is a sign of animal hoarding, which leads to cruelty, neglect, and abandonment. In the United States, each state varies on animal cruelty laws and how animal abuse is reported. In civil cases, if a person is ruled to have been abusive, the animal may be taken away and a fine will be ordered. For criminal cases, a person could face penalties including jail, fines, or both. Failing to provide proper necessities of care. 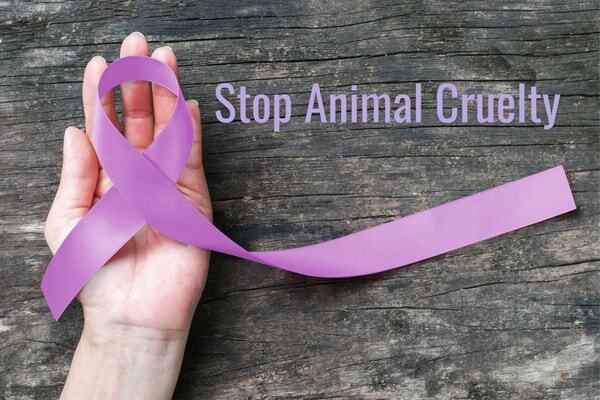 The best way to stop animal cruelty and keep it from happening is to recognize signs of mistreatment, report animal abuse, and help raise awareness to make a change. 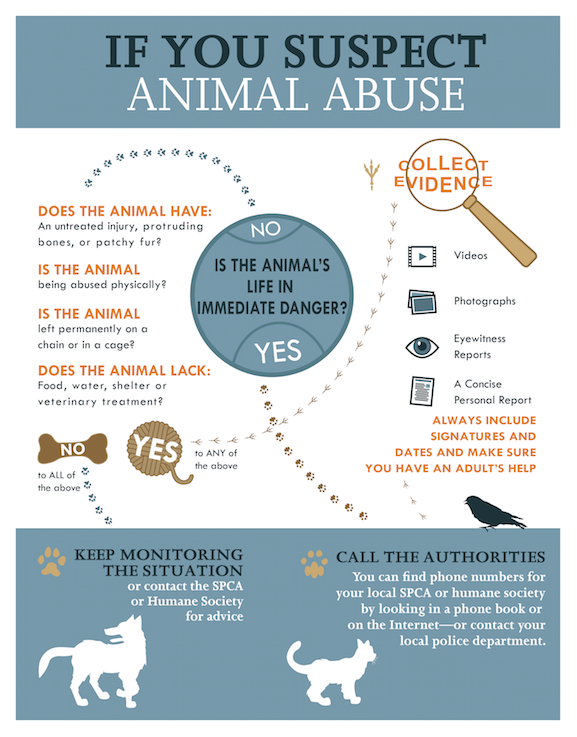 If you see an animal being abused, or notice signs of abuse, call a local animal welfare agency immediately. Reporting cruelty is the first step in helping our furry loved ones. In addition, raising mass awareness will be the quickest way to promote the prevention of animal abuse. Parents and educators can do this by teaching children how to safely interact with animals, as well as informing them on ways to tell if an animal is in harm or at risk. Also, spread the message with social media! Contact animal shelters and agencies, volunteer, start a fundraiser to help these local shelters. You can even wear a wristband to raise awareness and end the violence.